The perfect valentine doesn’t have to come from the store. 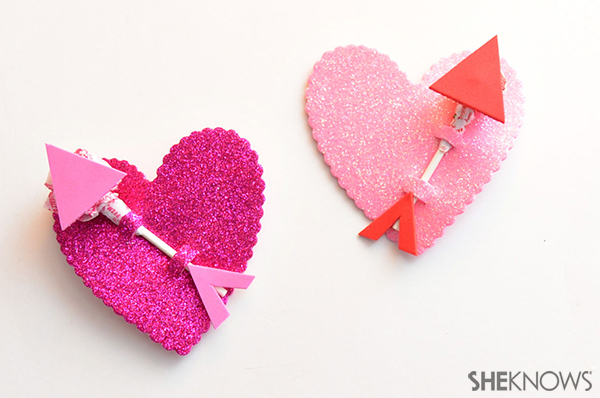 Transform your child’s favorite candy into adorable valentines for your child to pass out to friends and family! 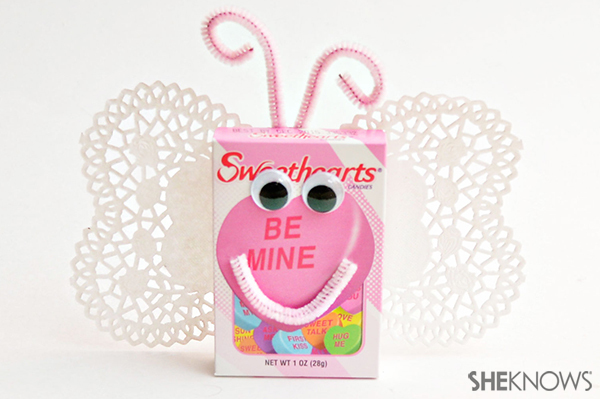 Glue the 2 heart-shaped doilies to the back of the box of conversation hearts to make the butterfly wings. Cut a pink pipe cleaner in half. Fold 1 of the halves in half into a “v”shape and curl the ends to make the antennae. Glue the antennae to the back of the box near the top. Glue 2 googly eyes to the front of the box. Cut a piece from the remaining half of pipe cleaner and bend it slightly to make a smile. Glue the smile below the googly eyes on the front of the box. Cut out a piece of scrapbook paper that is slightly smaller than the front of the card. Glue the piece of scrapbook paper to the front of the card. Glue 1 or 2 chocolate bars vertically on top of the scrapbook paper. Glue a Starburst at the top of each candy bar. Cut out 4 strips of metallic scrapbook paper for each robot, then fold the strips like an accordion. 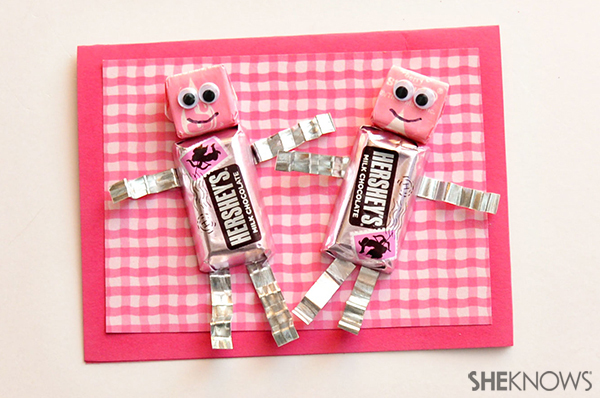 Glue the strips next to the chocolate bar to create the robot’s arms and legs. Glue 2 googly eyes on top of each Starburst, then use a pen to draw a mouth on the robot. Cut 2 slits side by side approximately 1/2 inch away from the edge of the craft foam heart. Cut 2 more slits approximately 1 inch away from the first slits. Slide the lollipop stick through the slits. Using a separate craft foam heart, cut out a small triangle and a small “v” shape. Glue the triangle over the lollipop, then glue the “v” shape to the lollipop stick opposite the triangle to make the arrow. Cut a piece of scrapbook paper that is slightly smaller than the front of the card, then glue the scrapbook paper to the card. 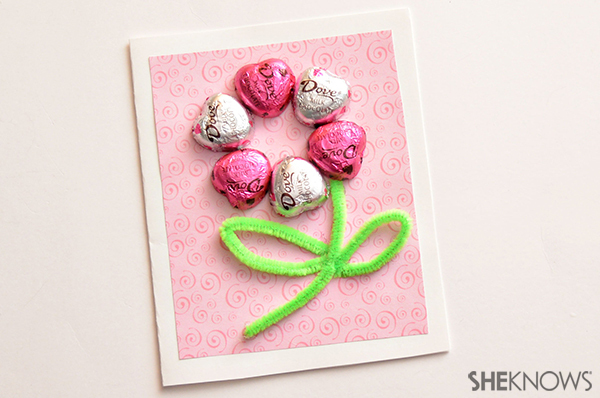 Lay out 6 heart-shaped chocolates in a circle with the pointed ends in near the top of the card. Glue each chocolate heart in place. Cut a green pipe cleaner in half. Glue 1 half of the pipe cleaner below the chocolates to make the stem. Cut the other half of the pipe cleaner in half again. Fold the 2 pieces into the shape of leaves and glue them to either side of the stem.